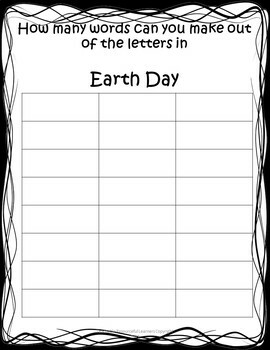 I designed this product for teachers to use to celebrate Earth Day. 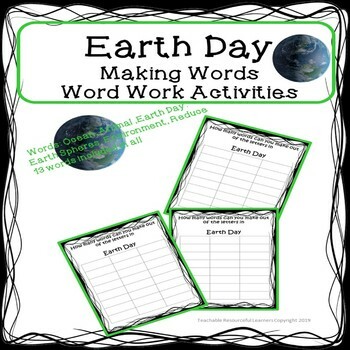 This resource is intended to be a fun and engaging activity to access the students spelling and ability to create words from phrases or words. This helps with building vocabulary. There are 13 words that relate to the Earth such as Reduce Reuse Recycle, Animal, Ocean, Earth Spheres plus others. Actual example of activity on cover. This activity is similar to The Making Words strategy that was developed by Jim and Pat Cunningham. If you desire you can use this to teach spelling words using rhyming patterns using rhyme and onset, the beginning of words.